There’s a new live video for AC Newman‘s insanely catchy “Like a Hitman, Like a Dancer” streaming right now over at Pitchfork.TV (and also embedded in this post). 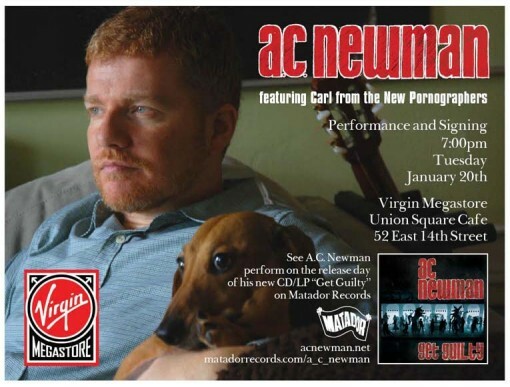 Just in case you forgot, Carl’s new record, Get Guilty is coming out next Tuesday (January 20), and he’ll be playing an in-store gig that night at Virgin Union Square with New Jersey’s own Nicole Atkins. Flyer for the in-store gig after the jump.